I'm working furiously to finish all the crafts I have planned for Little O's birthday party. Check out the invitations I made a few weeks ago. I have two weeks left. I think I can do it. If she takes some really LONG naps! Today I worked on the centerpieces for the four tables in the party room. 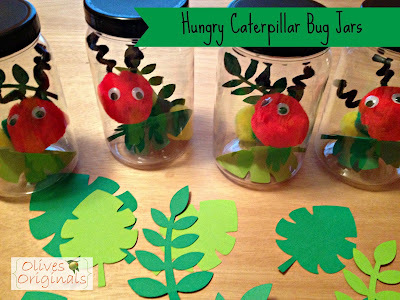 I decided on caterpillar bug jars to continue the Very Hungry Caterpillar theme. An assortment of pompoms. I used red, green, and yellow. The red one (for the head) is a slightly larger size than the green and yellow. I think it would be just as cute if all the pompoms were the same size. Plastic jars (you could use glass, but since mine are for a baby party, I opted for plastic). I got mine in the painting supply section of Hobby Lobby. First, I hot glued the pompoms together to create the caterpillar body. Then I glued the googly eyes to the head. Next, I attached the antennae. These are made out of black pipe cleaners. I placed the pipe cleaner under the caterpillar in the joint between the head and the first body segment. I wrapped the pipe cleaner around the "neck" and twisted it to hold it in place. After securing the pipe cleaners, I used a pencil to curl them into antennae. Here's what they looked like when they were finished. I used my Cricut to cut out leaves to decorate the inside of the jars. I used dark green and light green and two different styles of leaves. Here's the finished product. I think they turned out really cute. The caterpillars are a little larger than I had originally planned, but I like them anyway.